Despite the gray skies and the rain pelting my windows, I've got a cheery view in front of me as I write this. 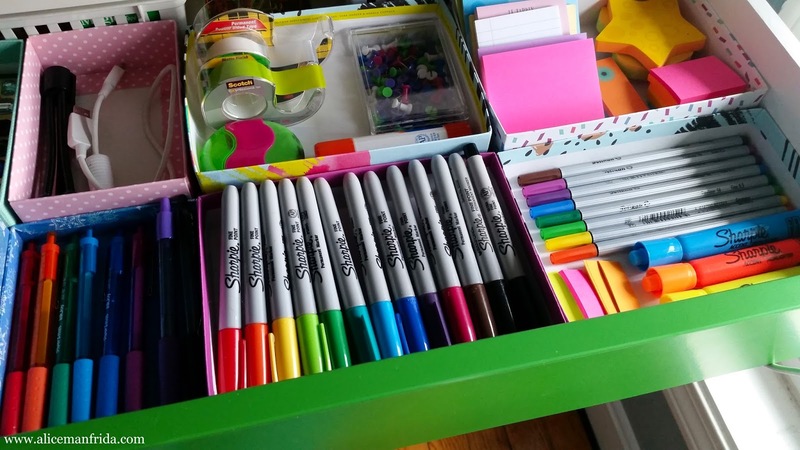 I am in love with my freshly organized desk drawer! There is nothing better, in my opinion, than a color theme and the kaleidoscope of rainbows happening in this drawer have been making me happy all week. The desk is the Micke desk from Ikea and the main drawer is huge. Without dividers it's really easy for all of your supplies to turn into a jumbled mess. The problem is that dividers can be really expensive. Even so called “affordable” dividers and bins can add up if you need to buy a lot of them. I reused the bottoms and tops of some old Birchbox boxes. I had them hanging around anyway and they brought a little extra color into the drawer. I kept the pens up front because I use them the most. Behind those I have sticky notes, tape and other standard desk supplies. I also had a couple of boxes that thank you cards came in and that filled up the rest of the space nicely. (Go figure, this desk drawer was not designed to specifically accommodate Birchboxes! Ha ha!) I also keep a little tripod and the cord I use to connect my camera to my laptop in there. You can't see it in the picture but I've got just enough room to keep my stapler and my phone stand tucked in on the left. The white plastic bins that are peeking out in the way back are really old. I don't remember where I got them but I used to use them in my kitchen in past apartments. The drawer doesn't open up enough to access them easily so I've got spare pens and pencils and some other back up items stored back there.